. We’ll let you know of any disruptions on the Underground that are happening at the time you need them most. 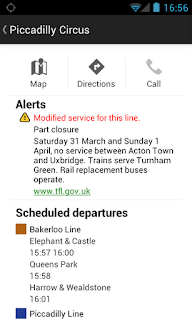 To see these alerts, click on a station in a timetable or in the public transport directions results. Last summer we announced live transit updates, providing travelers with up-to-date information when planning their trips. We are excited about adding real time alerts for the 1 billion passengers that use the Underground every year. In addition to the service alerts in real time, we’ve included planned engineering works for the weekends in our journey planner as well. When planning a trip for the coming weekend, we will show you the relevant subway alerts as part of the directions results. You can plan a trip for the weekend by changing the departure time in the ‘Get directions’ tab. Should there be planned engineering works for your route, you won’t run into any surprises on the day of travel. 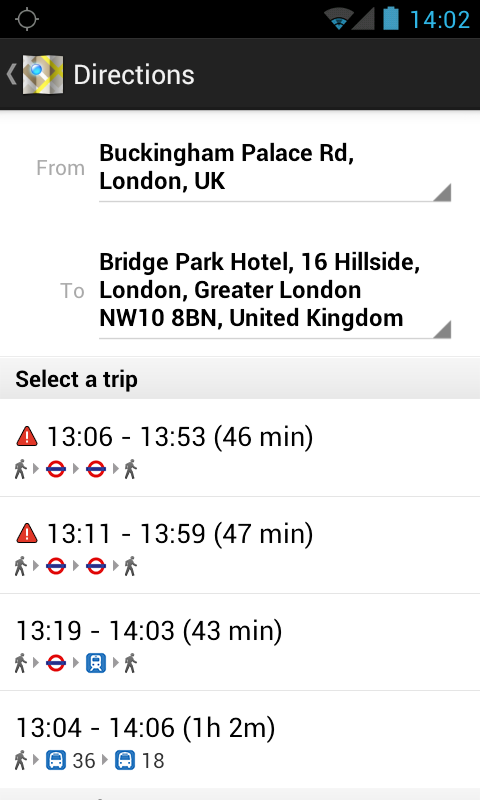 As usual, this information is available on maps.google.co.uk for desktop and mobile, but also on Google Maps for Android. 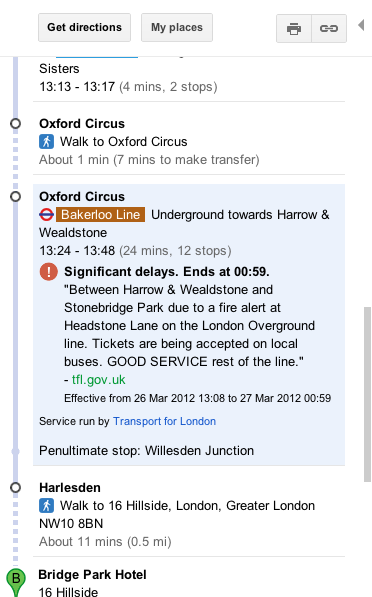 So even when you’re on the go, you’ll always be informed of the latest status of the Underground. Just tap on a station to see if there are any alerts active, or get directions to your destination to see if an alert affects your travels. 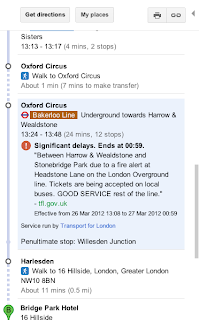 Public transport directions in Britain are available for all national train routes, London Underground, Overground, DLR and bus routes, and many local bus routes. 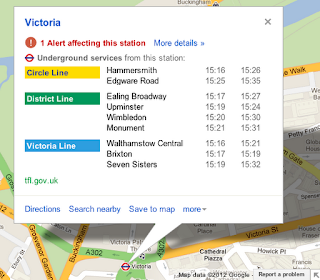 Whether you call London home or you’re one of the expected 31 million tourists visiting the city this year, we know that the addition of service alerts to Google Maps will make your travels across the city easier, faster and more convenient. 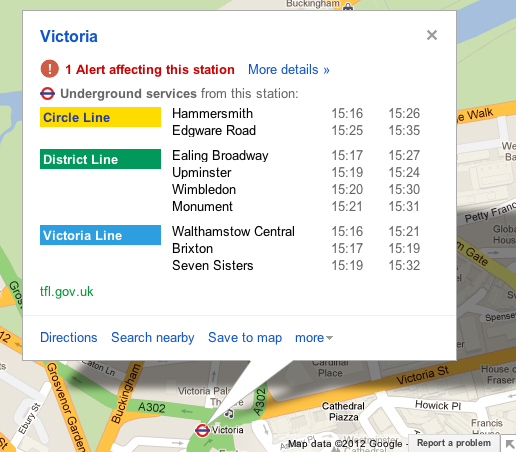 Ahead of a busy summer in London, we are bringing real time service alerts for the London Underground to Google Maps. 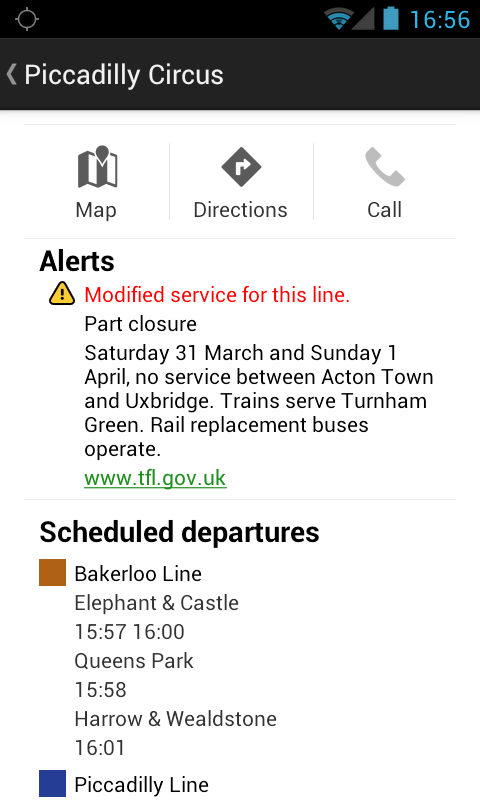 We’ll let you know of any disruptions on the Underground that are happening at the time you need them most. 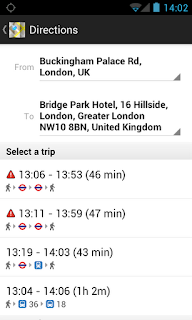 To see these alerts, click on a station in a timetable or in the public transport directions results.